Today I’ve got something a bit special in terms of Irish whiskey, it’s my first Redbreast. Maybe not exactly the best intro to the range though, as it’s a Sherry monster single cask for The Whisky Exchange. Redbreast is a brand distilled at the New Midleton distillery, I believe. 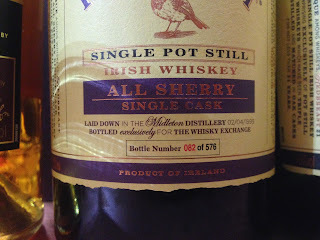 But I had heard that it is one of the best Irish whiskies out there. Nose: Full on, meaty Sherry, oily and very Irish. Syrupy fruit, fig, almost overly sweet. Taste: Very oily, creamy, red berry, meaty Sherry, red wine-esque. Big mouthfeel, although not as complex as I was expecting. Finish: Medium/Long length. More meaty red fruit and berry. With water, this really did better with more balance and integration, a little softer and less sweet too. Definitely the best Irish whiskey I’ve had so far, but I was expecting more from a single cask of a brand with quite a few fans. Also the price is high at £160, of course it’s only available from The Whisky Exchange.